Danish Morten Top Truelsen speaks TriStar Madrid after yesterday's swim training! He is one of the main favourites to take the win today at Casa de Campo. Good luck! High5 is the official nutrition partner for TriStar Madrid 2012. These are some of the products you could get in the Energy Stations! High5 is the official Nutrition partner of TriStar Madrid 2012. 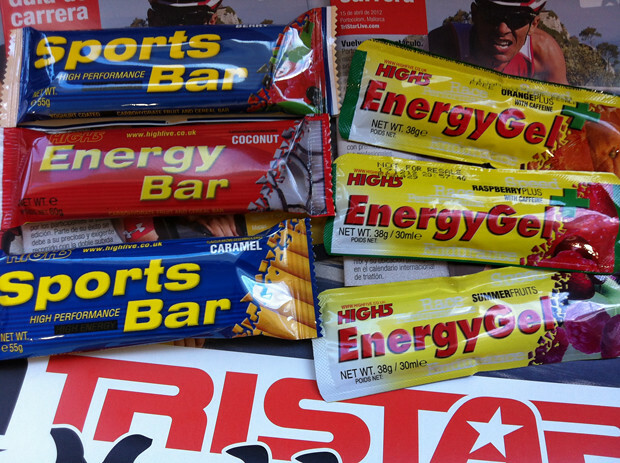 These are some of the great products you could get before, during and after you TriStar race at the Energy Stations. Have fun, with High5 is easier, and you will race faster! The High5 Faster & Further Nutrition Guides apply the latest scientific findings, to provide step-by-step nutrition guides for each sport, race distance, race day weather and athlete body-weight. The guides are practical, easy to follow and ensure the optimum performance boosting intake of carbohydrate and caffeine. If you follow these guides you will ride substantially faster and further. You can find detailed guides for Road Cycling, MTB, Triathlon and Running at: www.highfive.co.uk. “We are excited to partner with High5 because it means we are supporting the empowerment of TriStar athletes, helping them to accomplish their goals and to have more fun while they are racing!”, said Laurent Gauthier, president of Star Production SARL. For your chance to win an entry to a High5 Partner Event in the TriStar Series, visit the High5 Facebook Page (www.facebook.com/High5Nutrition). To celebrate the new partnership, High5 are also giving away a Race Faster Pack to the next 50 athletes that sign up to TriStar111 Milton Keynes. “High5 is a UK company focused on providing endurance nutrition that is scientifically formulated, 100% fit for purpose and with natural flavours for a great taste. We design, develop and manufacture our own products to ensure they represent state-of-the-art nutrition technology. High5 bars, gels and drinks fuel many of the world’s greatest power & endurance athletes in the toughest competitions. Whether you’re looking to boost your speed and endurance, break through a performance plateau, ramp up your energy levels, increase fat loss, improve your athletic performance or fuel post-workout recovery, you can count on High5 to deliver new and innovative products you can trust.